Here's what to do in Anthem once you complete the main story. Anthem is just weeks away from launch, and BioWare has shared new details about the endgame content and future roadmap for its new live-service title. The first season of content will be available in March with two more "Acts" planned for later in the year. Anthem's initial level cap will be level 30, but that's when the endgame content will begin in earnest. Like Destiny, players will be spending the endgame strengthening their weapons and Javelin to prepare for high-level challenges. In a new video, BioWare revealed several ways to grind for legendary loot and upgrades. Players can begin earning high-level gear and weapons by either replaying Anthem missions at harder difficulty levels, completing Contracts and Legendary Contracts assigned by NPCs on Fort Tarsis, and by completing raid-like challenges called Strongholds. BioWare says new challenges will be available daily, weekly, and monthly. In our interview with BioWare, the developers shared how Anthem will incorporate Fortnite-like updates that can change the world in subtle or huge ways. These changes can be explored for additional legendary gear and more challenges. The first season culminates in a world event called "The Cataclysm." This event will change Anthem in ways not unlike Fortnite's seasonal changes, with new environments and enemies. 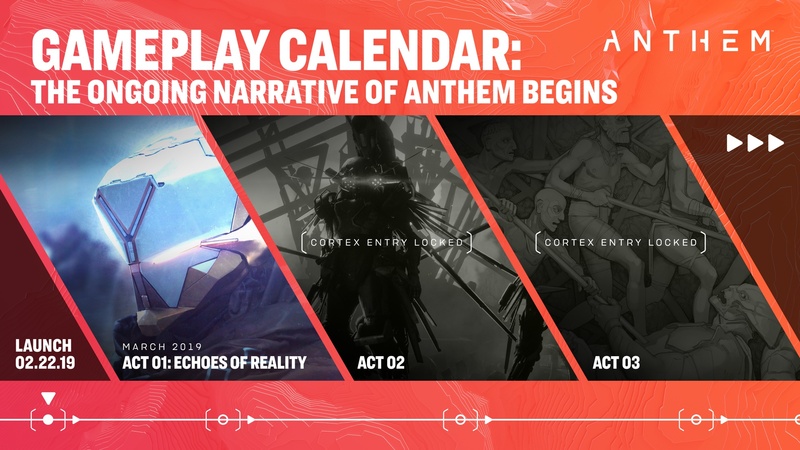 Anthem's full calendar remains "locked" however, so we'll have more details for what changes the second and third acts will bring to Anthem. Dedicated players tend to finish mainline content extremely quickly, so live-service games like Anthem essentially live or die based on their endgame content. It looks like BioWare is anticipating this and will release the first update "Evolving World" soon after launch on February 22. 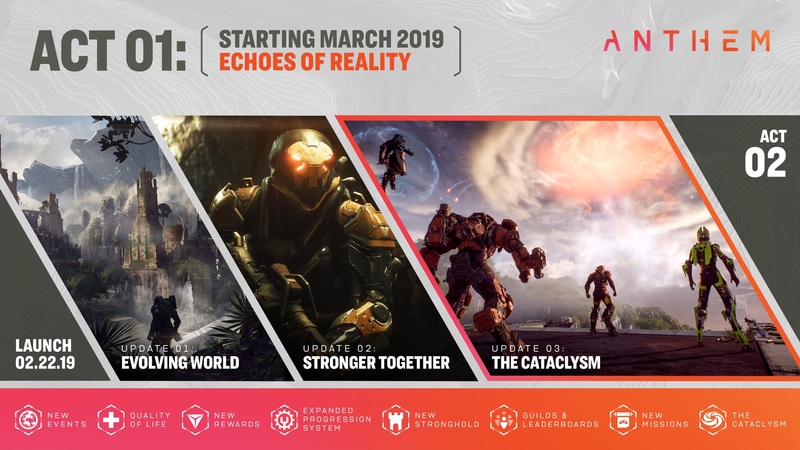 EA Origins Access Premier members can play Anthem even earlier on February 15, so they'll have even more of a headstart on content. Hopefully there's enough to keep players engaged when Anthem launches a week later for everyone on PS4, Xbox One, and PC. Check out our Anthem guide for full release details, previews, trailers, and more. Tagged with Action Adventure,	Bioware,	Electronic Arts,	News,	PC,	PlayStation 4,	Role Playing Games,	Shooters,	Xbox One.